If you've ever said 'I want to learn to fly' there's no better time to take the leap and find out more about learning how to fly a plane with these great value 60 minute lessons from Intotheblue. 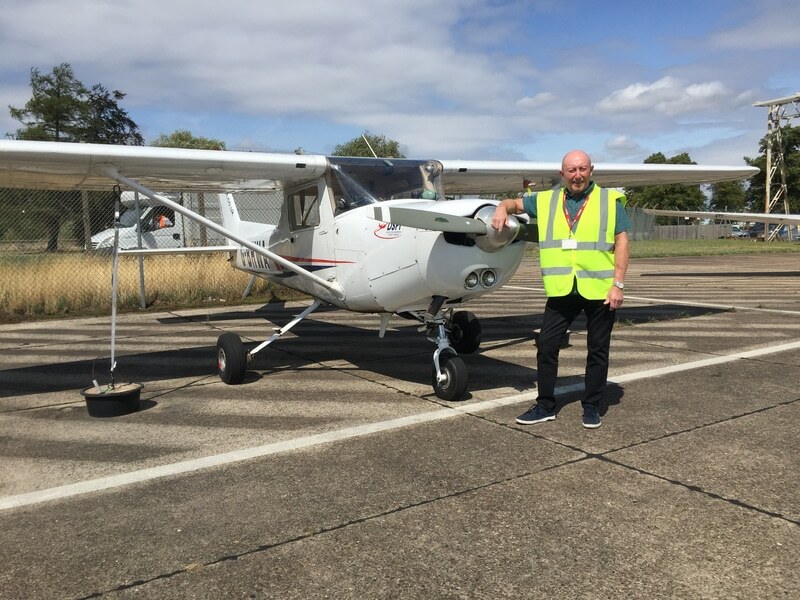 This is where you'll get a real insight into learning what it takes to fly in a modern light aircraft and what all this talk of addiction to flying is all about. So where are the flying lessons near me? We've got a whole host of venues across the UK for you to choose from, so no matter where you are, you won't have to travel far to be able to fly. Learning the basics on one of our 60 minute lessons is a thrilling introduction to the 'wonderful world of flight'. On arriving at your chosen training school you'll be introduced to your pilot instructor, who will then run through the plane's safety briefing with you on the ground, including how things like the fuel needs to be checked before you fly, along with the plane's nose wheel, aileron and flaps - to name but a few. Even once the aircraft's engine has started there are checklists on taxiing and just before takeoff, so it's a busy time in the cockpit and, being seated up front beside your pilot, you'll be able to take it all in. Once given clearance to fly by Air Traffic Control, make the most of the take off to check out the views below from your privileged position, as once the plane has reached altitude, gazing out of the window stops and it's time to learn just how easy it is to fly one of these fabulous little planes. You will be charged with flying the plane to altitude, whilst the instructor keeps the plane trimmed, manages the rudder and speaks to ATC. Before you know it you will be learning how to make turns, keep the nose up (but not too much!) and come out of the manoeuvre still flying at the target altitude in your plane. How your 60 minute flying time is described, chock to chock, means that it runs from when the plane taxis away, to switching the engine off on your return. You will soon learn that you can cover a surprising distance in that time, giving you ample opportunity to get a feeling you are really learning to fly as you relax into being behind the controls of the plane. If you want to learn to fly to gain your Private Pilot's Licence, these one hour fly a plane experiences will count towards your training course if you continue learning to fly in a light airplane. However, if you're not tempted by getting airborne, why not have an inspirational browse of our gifts section for more amazing gift ideas from IntotheBlue! 71 people recommend this product. 60 Minute Flying Lessons Nationwide 78 of 163 people found the following review helpful. 60 Minute Flying Lessons Nationwide 88 of 184 people found the following review helpful.